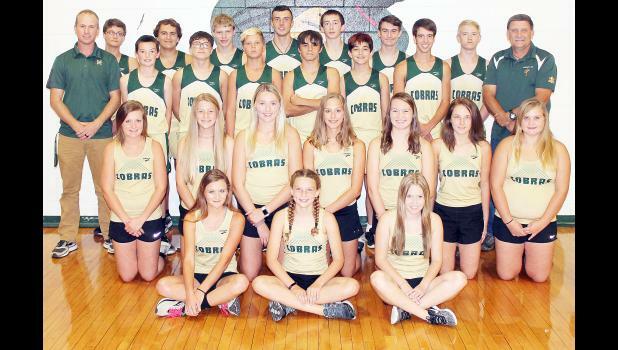 The 2018 Jackson Heights cross-country team is shown in the photo above. Front row, from left: Jill Buck, Ellie Gresham and Skyla Howe. Second row, from left: Jessica Buck, Annie Allen, Trinity McMahon, Shelby Phillips, Faith Little, Cheyenne Hewitt and Josie Buck. Third row, from left: head coach Brad Alley, Jackson Zule, Alex Browning, Devin Mock, Wyatt Bacon, Jarred McAlpine, Drew Holliday and assistant coach Gary Keehn. Back row, from left: Curtis Hundley, Rhett Kennedy, Garrett Klahr, AJ Mock, Kolten Brenner, Daniel Little and Ben Stites.